Heikki Aalto, Vice President at Delfoi – a leading provider of simulation based software and services – discusses his experiences from working with Visual Components. 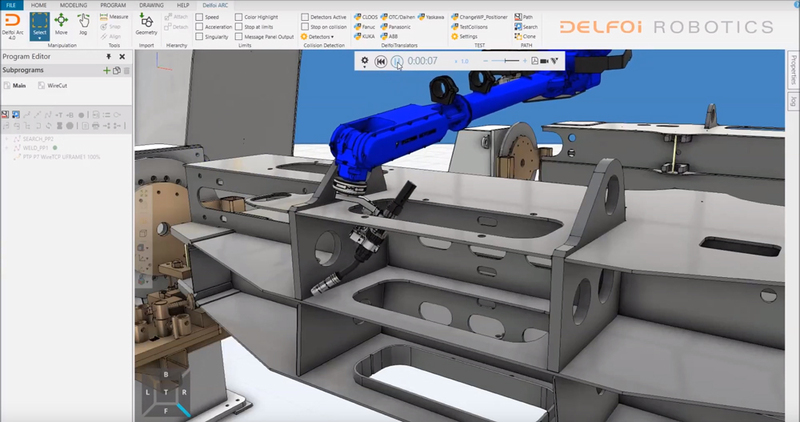 The Delfoi-Visual Components collaboration started from Delfoi’s desire to bring welding simulation to the next level. “It seemed like Visual Components and we had the same goal,” says Heikki Aalto. The flexibility and openness of the Visual Components platform have been the key benefits for Delfoi during the collaboration. “We are able to develop and brand the applications as our own,” says Heikki Aalto. One thing greatly appreciated by Delfoi is the increase in efficiency the Visual Components products provide. “We have been able to create new functionalities which save a lot of time when implementing the software,” says Heikki Aalto. The welding paths generated with the off-line programming tools in Visual Components work right away. Manual calibration is reduced to the minimum. “Fast” is the word that comes up every time we talk to the Visual Components partners. This is also the case with Delfoi. According to Heikki Aalto, Delfoi has developed offline programming tools for fast program creation on top of the Visual Components platform. “For open and fairly simple structures like ship blocks or steel beams the programming can be automatized. We have delivered an automated off-line programming application to Lindab, Luxemburg. It takes only 60 seconds to create a complete welding program for a one-of-a kind beam structure!,” Heikki Aalto says. The Delfoi – Visual Components collaboration continues. “Our sales have really picked up since we got into using the Visual Components solutions. Our clients are really happy too. Sometimes they have a hard time believing the results we are able to generate. That obviously makes us glad!” Heikki Aalto says. The ability to create easy-to-use, flexible solutions for their clients faster and for less money has made Visual Components a valuable partner for Delfoi.“The collaboration is built on a strong foundation, in my view. I see many great opportunities to come,” says Heikki Aalto. Our sales have really picked up since we got into using the Visual Components solutions. Our clients are really happy too. Sometimes they have a hard time believing the results we are able to generate. That obviously makes us glad!